Hopefully those looking for practical information on electrical circuits and wiring LED components found this guide first. 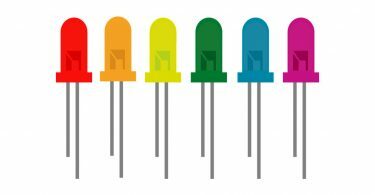 It’s likely though, you’ve already read the Wikipedia page about Series and parallel circuits here, maybe a few other Google search results on the subject and are still unclear or wanting more specific information as it pertains to LEDs. 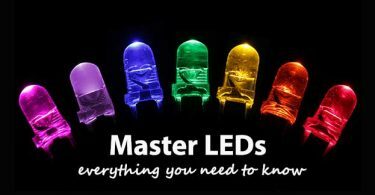 With years of providing LED education, training and explaining the electronic circuit concept to customers, we have gathered and prepared all the critical information needed to help you understand the concept of electrical circuits and their relationship to LEDs. What type of circuit should I use? Is one better than the other…Series, Parallel or Series/Parallel? 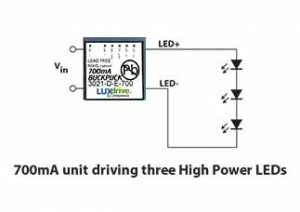 The requirements of a lighting application often dictate what type of circuit can be used, but if given the choice, the most efficient way to run high power LEDs is using a series circuit with a constant current LED driver. Running a series circuit helps to provide the same amount of current to each LED. This means each LED in the circuit will be the same brightness and will not allow a single LED to hog more current than another. When each LED is receiving the same current it helps eliminate issues like thermal runaway. Don’t worry, a parallel circuit is still a viable option and used often; later we will outline this type of circuit. 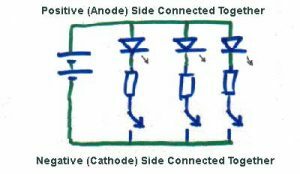 Often referred to as ‘daisy-chained’ or ‘looped’ the current in a series circuit follows one path from start-to-finish with the Anode (positive) of the second LED connected to the Cathode (negative) of the first. The image to the right shows an example: To wire a series circuit like the one shown, the positive output from the driver connects to the positive of the first LED and from that LED a connection is made from the negative to the positive of the second LED and so on, until the last LED in the circuit. 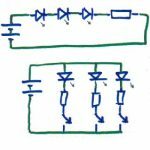 Finally, the last LED connection goes from the negative of the LED to the negative output of the constant current driver, creating a continuous loop or daisy chain. The loop concept is no problem by now and you definitely could figure how how to wire it, but how about powering a series circuit. The second bullet point above states, “The total voltage of the circuit is the sum of the voltages across each LED”. This means you have to supply, at minimum, the sum of the forward voltages of each LED. Lets take a look at this by using the above circuit again as an example and lets assume the LED is a Cree XP-L driven at 1050mA with a forward voltage of 2.95V. The sum of three of these LED forward voltages is equal to 8.85Vdc. So theoretically, 8.85V is the minimum required input voltage to drive this circuit. In the beginning, we mentioned using a constant current LED driver because these power modules can vary their output voltages to match the series circuit. As LEDs heat up their forward voltages change, so it’s important to use a driver that can vary its output voltage, but keep the same output current. For a deeper understanding of LED drivers take a look here. But, in general it’s important to make sure that your input voltage into the driver can deliver an output voltage equal to or greater than the 8.85V we figured above. 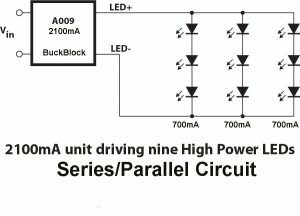 Some drivers require inputting slightly more to account for powering the internal circuitry of the driver (the BuckBlock Driver needs a 2V overhead), while others have boosting (FlexBlock) features that allow you to input less. Hopefully you are able to find a driver that can accomplish your LED circuit with the diodes in-series, however there are circumstances that might make it impossible. Sometimes the input voltage might not be enough to power multiple LEDs in-series, or maybe there are too many LEDs to have in-series or you just want to limit the cost of LED drivers. Whatever the reason, here is how to understand and configure a parallel LED circuit. Where a series circuit receives the same current to each LED, a parallel circuit receives the same voltage to each LED and the total current to each LED is the total current output of the driver divided by the number of parallel LEDs. Again, don’t worry, here we will see how to wire a parallel LED circuit and that should help tie the ideas together. In a parallel circuit all the positive connections are tied together and back to the positive output of the LED driver and all the negative connections are tied together and back to the negative output of the driver. Lets take a look at this in the image to the right. Using the example shown with a 1000mA output driver, each LED would receive 333mA; the total output of the driver (1000mA) divided by the number of parallel strings (3). As the name implies a series/parallel circuit combines elements of each circuit. Lets start with the series part of the circuit. Lets say we want to run a total of 9 Cree XP-L LEDs at 700mA each with a voltage of 12Vdc; the forward voltage of each LED at 700mA is 2.98Vdc. Rule number 2 from the series circuit bullet points proves that 12Vdc isn’t enough voltage to run all 9 LEDs in-series (9 x 2.98= 26.82Vdc). However, 12Vdc is enough to run three in-series (3 x 2.98= 8.94Vdc). And, from the parallel circuit rule number 3 we know that total current output gets divided by the number of parallel strings. So, if we were to use a 2100mA BuckBlock and have three parallel strings of 3 LEDs in-series, then the 2100mA would get divided by three and each series would receive 700mA. The example image shows this set-up. If you are trying to set up an LED array this LED circuit planning tool will help you decide what circuit to use. It actually gives you several different options of different series and series/parallel circuits that would work. All you need to know is your input voltage, LED forward voltage and how many LEDs you wish to use. One thing to keep in mind about running parallel and series/parallel circuits is that if a string or LED burns out, the LED/string will then be cut out of the circuit so the extra current load that was going to that LED will then be distributed to the rest. This isn’t a huge issue with larger arrays as the current will be dispersed at smaller amounts but what about a circuit with just 2 leds/strings? The current would then be doubled for the left over LED/string which might be a higher load than the LED can handle resulting in a burn out and ruining your LED! Make sure you always keep this in mind and try to have a set up that wouldn’t ruin all your LEDs if one happened to burn out. Another potential issue is that even when LEDs come from the same production batch (same binning) the forward voltage can still have a 20% tolerance. Varying voltages across separate strings results in the current not being divided equally. When one string draws more current than another, the LEDs being overdriven will heat up and their forward voltages will change more, resulting in more unequal current sharing; this is called thermal runaway. We have seen many circuits set-up like this work well, but caution is required. For more information on this concept and ways to help avoid it (current mirror) there is a great article here within LEDmagazine.com.